When you need to up the ante on your next promotional campaign, our Premium Gift Boxes are a great way to present your best clients with branded glassware or mugs. We have three gift boxes in this range, and all of them are popular with our customers. 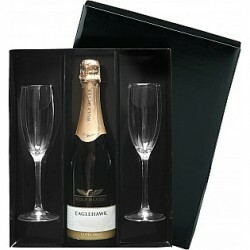 Firstly, our Champagne Gift Set comes with two branded Champagne flutes in a branded gift box; all you need to do is add a quality bottle of sparkling wine (and maybe a chocolate or two) to have a complete promotional gift to give to your clients. Next, our Flask Gift Set is perfect if you have clients who travel a lot, or who spend their day on the road. This set incorporates two branded porcelain coffee mugs, and a flask with the same logo print. Ready to present, your on-the-road clients will love carrying these around with them. 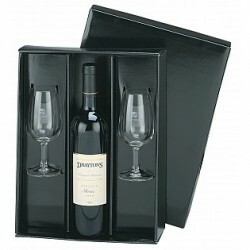 Finally, our Wine Gift Set consists of two small wine glasses printed with your logo, presented in a branded gift box. All you need to do is add a quality bottle of wine, which can easily be inserted into the centre of the box, and you have a gift ready to go for new or existing clients. Our Premium Gift Boxes make a great promotional gift item and we are 100% sure that your clients, new or old, will love receiving one of these.